Archbishop Loy Choy is expected to make a statement about Mary after the event. The weeping Mary statue at Wairiki, Taveuni. 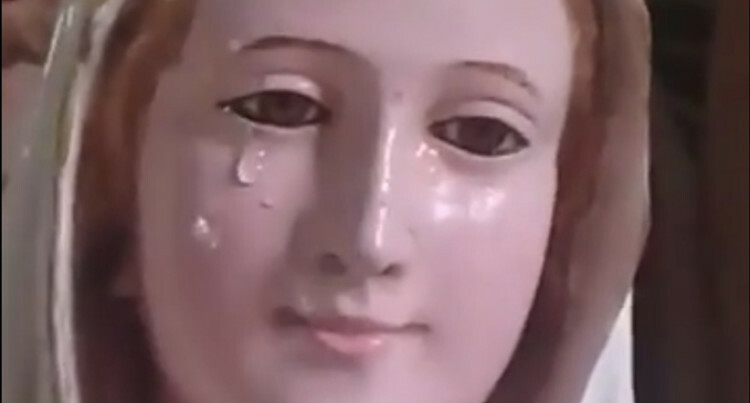 There is still no word on the whereabouts of the “weeping” Virgin Mary statue. Those carrying it may have suddenly gone underground because of the high interest generated by a BTL report yesterday. People on Taveuni who were speaking openly about it have suddenly gone quiet too and not speaking to BTL. It is understood that the head of the Catholic Church in Fiji, Archbishop Peter Loy Chong, will be travelling to Labasa for a Chrism Mass for priests in the North from Taveuni, Savusavu and Labasa tomorrow at Holy Family parish. The event agenda is privy to those attending. He will review the Mary report from the Wairiki parish clergy who will be attending the event. Meanwhile, in Taveuni, people who came into contact with the statue are privately sharing their spiritual experiences. They cannot stop talking about seeing the “tears” of Mary and wiping them. They interpret the experience as a wonderful blessing. This phenomenon is not uncommon. It has happened in other countries. The statue from the Vatican in Rome, has been on an international journey and Fiji is on the list of stops. It is accompanied by a Vatican team, BTL understands.